The MS2724B handheld spectrum analyzer is designed to conduct highly accurate analysis on the new wave of wireless LAN and cellular signals, including 802.11a, 3G, ultra-wideband, and wireless medical patient monitoring systems. 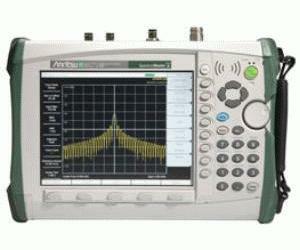 The next generation of the Anritsu best selling Spectrum Master, the MS2724B is a small and easy to use portable spectrum analyzer with unprecedented measurement capability for applications up to 20 GHz. Weighing in at less than 8 pounds, it is equally at home on the engineering bench and in the field. It is ideally suited for measuring up to the fifth harmonic of 3G cellular phone base stations. The B series family includes the MS2721B with performance from 9 kHz to 7.1 GHz and the MS2723B with performance from 9 kHz to 13 GHz. An option adds spectrogram, signal strength and RSSI. There is an option to add a user definable channel scanner option that is excellent for interference mitigation work in complicated RF environments. Options to measure WCDMA signals are available.